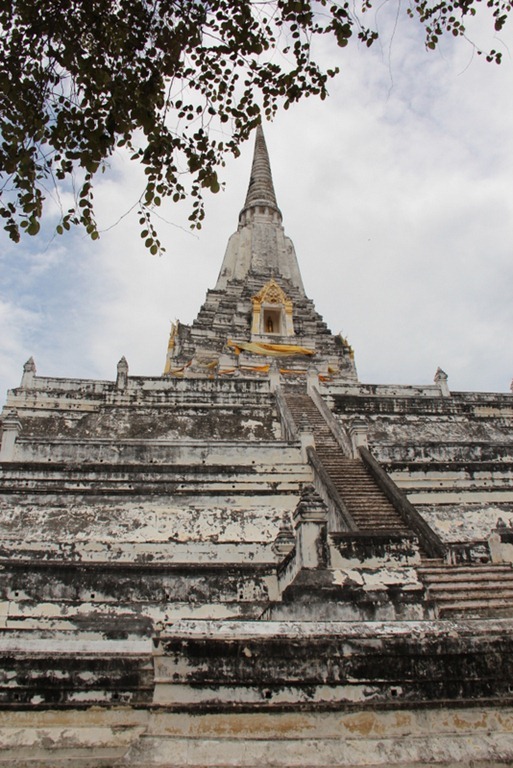 This is the third in a five-part series on Ayutthaya, Thailand about Wat Phu Khao Thong, a restored Buddhist temple dating back to the Ayutthaya Kingdom period (1350-1767). 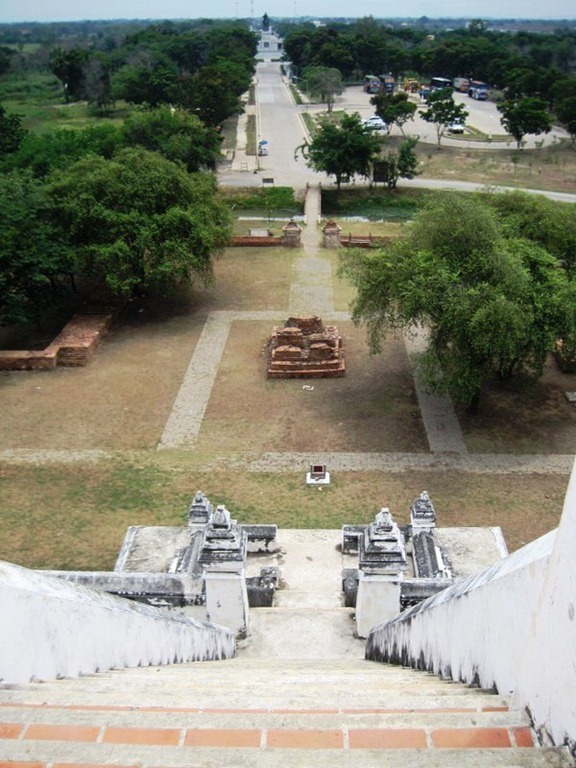 The first article described the historic City of Ayutthaya; the second, the temple ruins of Wat Chaiwatthanaram. 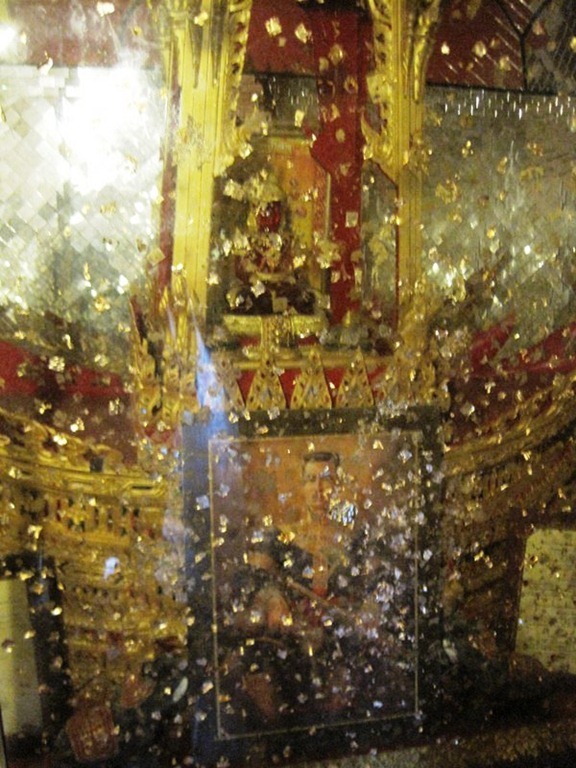 Upcoming posts will feature the ruins Wat Mahathat and the Wat Yai Chai Mongkon temple. Wat Phu Khao Thong, or the “Temple of the Golden Mount” in Ayutthaya, is a large Buddhist complex located about two kilometers (one mile) northwest of the city center. 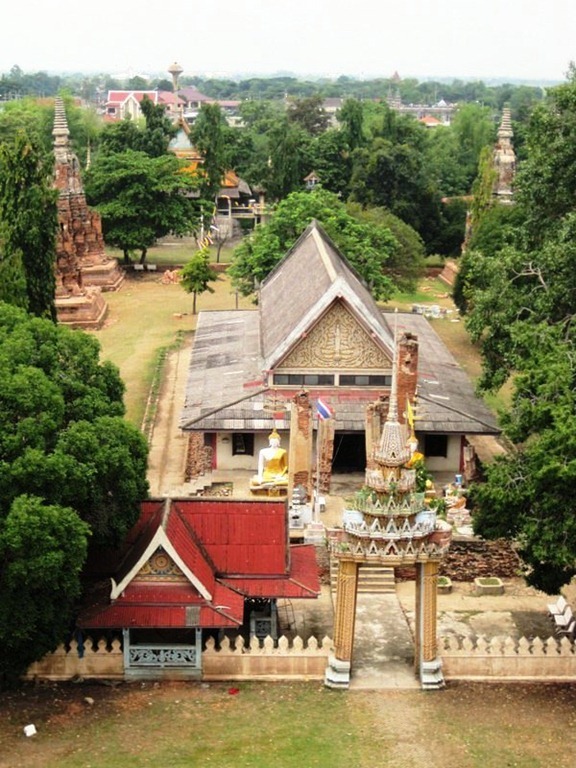 The restored temple was built in 1387 during the reign of King Ramesuan (1339-95) of the Ayutthaya Kingdom. 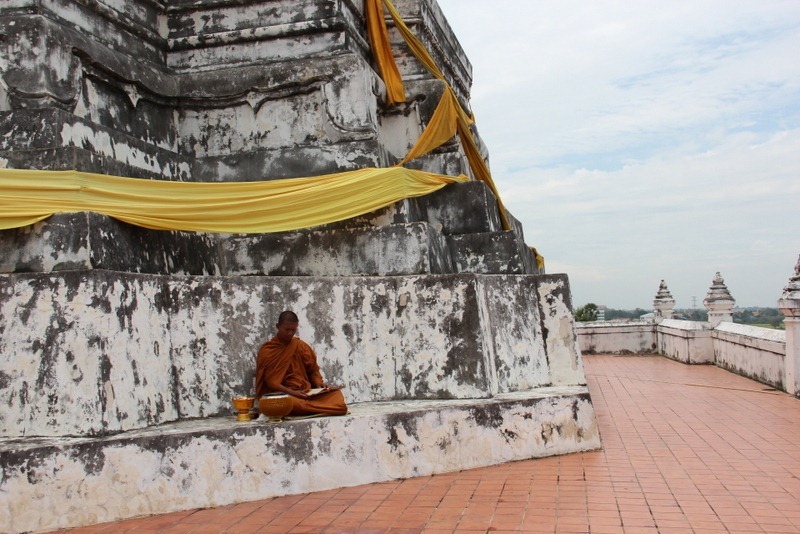 In 1991, UNESCO designated it a World Heritage Site within Ayutthaya Historical Park. 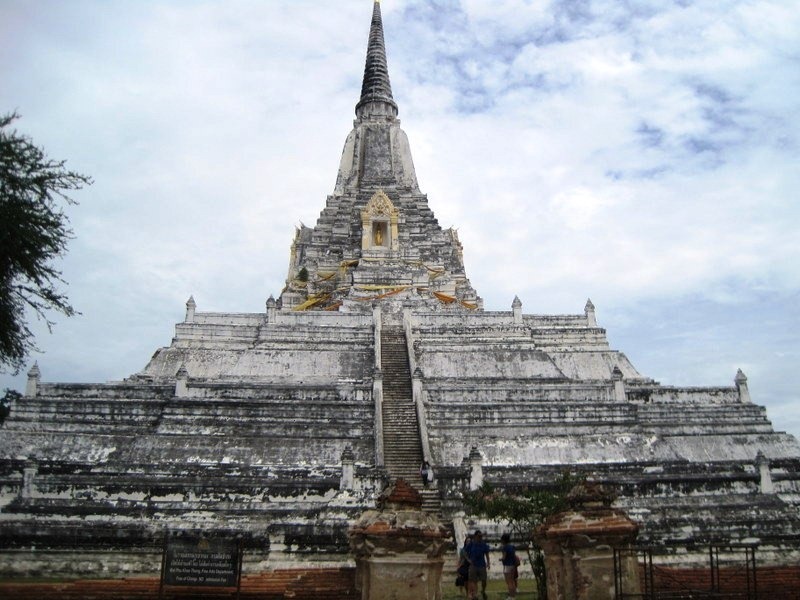 Its famous chedi or stupa (pagoda) that rises more than 30 meters (100 feet) above the Chao Phraya River offers one of the best views in Ayutthaya. 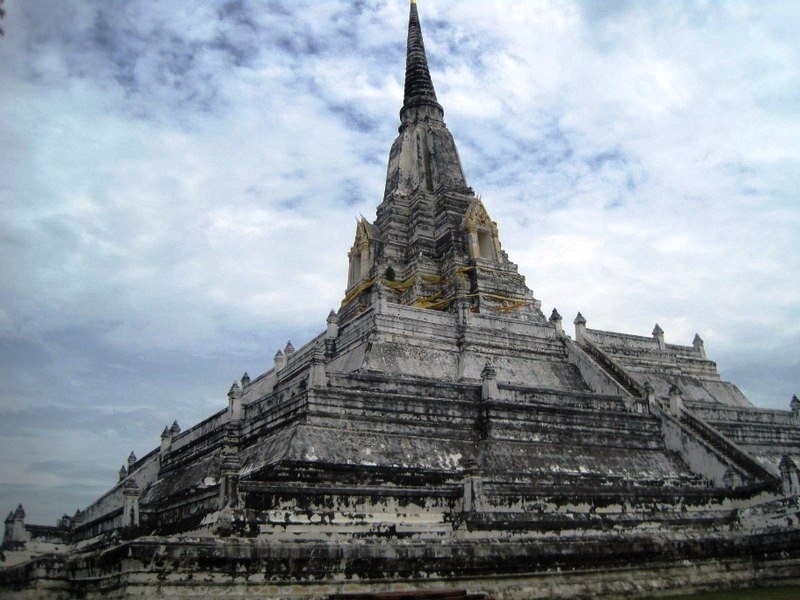 Following his capture of Ayutthaya in 1569 at the end of the first Burmese-Siamese War, Burmese King Bhureng Noung began to construct a large Burmese Mon-style chedi on the site to commemorate his victory. 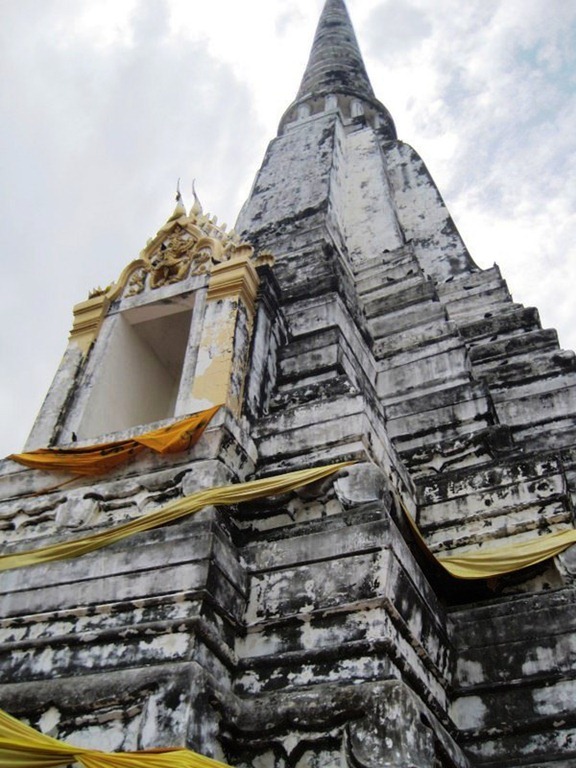 The structure was not completed until 1587, when then-Prince Naresuan of the Ayutthaya Kingdom (1590-1605) finished it as Thai-style chedi to honor Ayutthaya’s independence from Burma in 1584. The chedi was renovated in 1744 to its current form, a large square Burmese Mon-style base that rises at a moderate angle to a smaller base supporting a Thai-style chedi with a steep point. 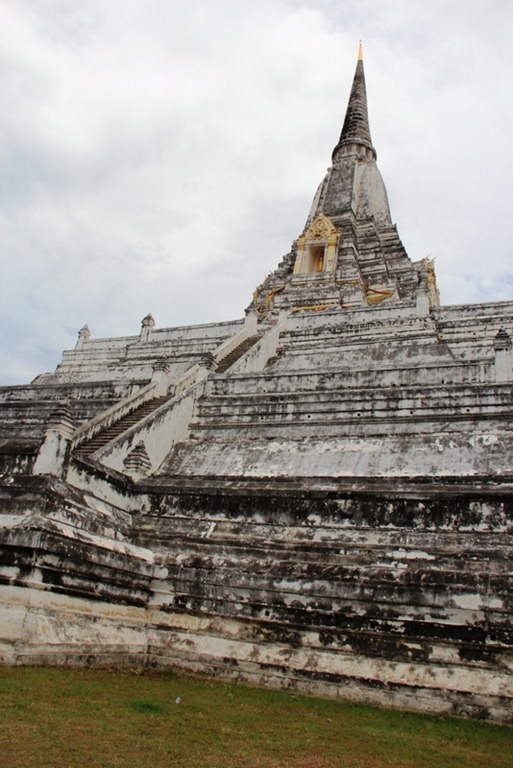 The entire hybrid structure is considered a single chedi. Four sets of stairs, one on each side, ascend to the second base. 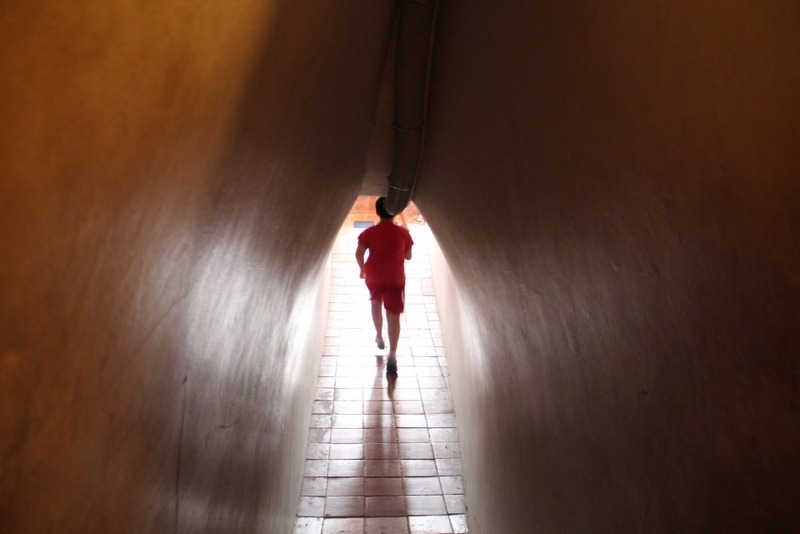 A nondescript passageway on the upper base leads to a sacred Buddhist shrine in the heart of the structure. 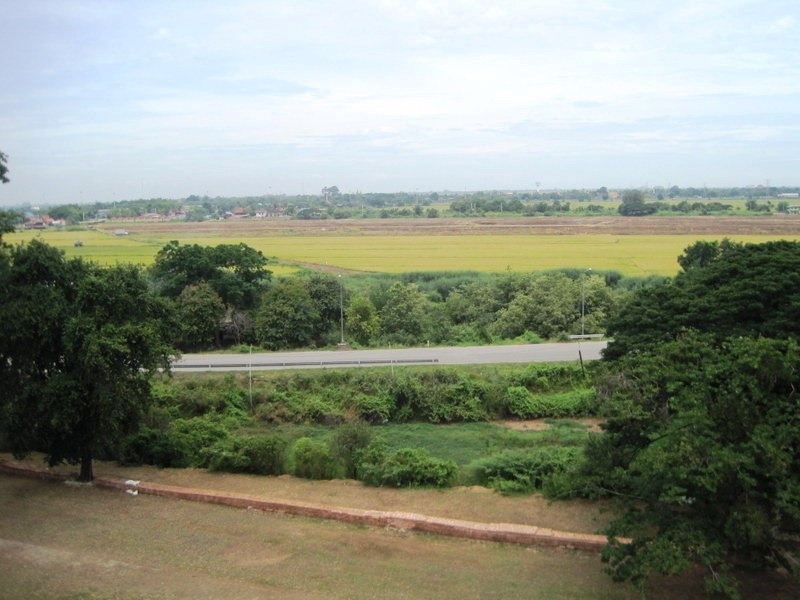 The chedi dominates Ayutthaya’s landscape and offers great views of the countryside west of the city. A contemporary Buddhist temple built on the ruins of its predecessor lies to the south. The remains of a canal that once linked the temple to the Chao Phraya River borders it to the east. 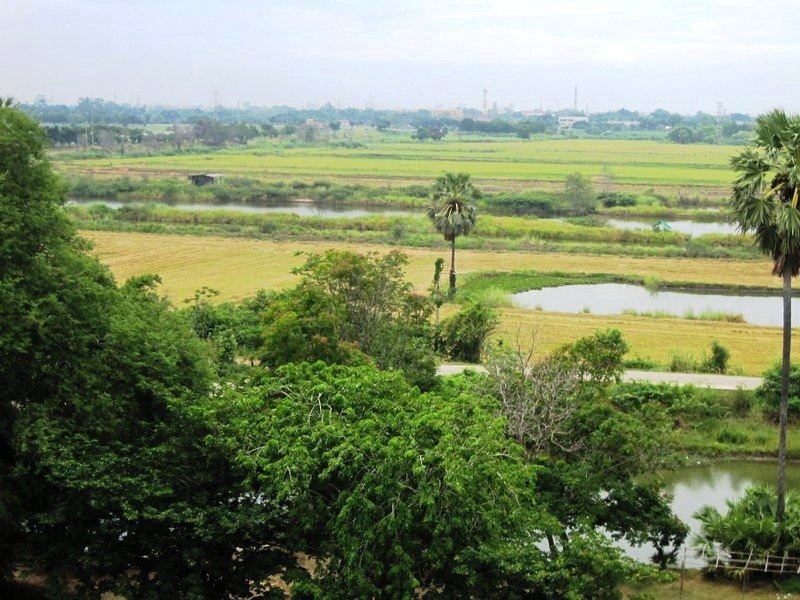 Now accessible by road, the canal fell into disuse following the destruction of Ayutthaya in 1767. To the north is a monument dedicated to King Naresuan with a statue of the legendary king mounted on horseback. Large, colorful statues of chickens surround the monument, reportedly paying homage to the king’s fondness for the bird. 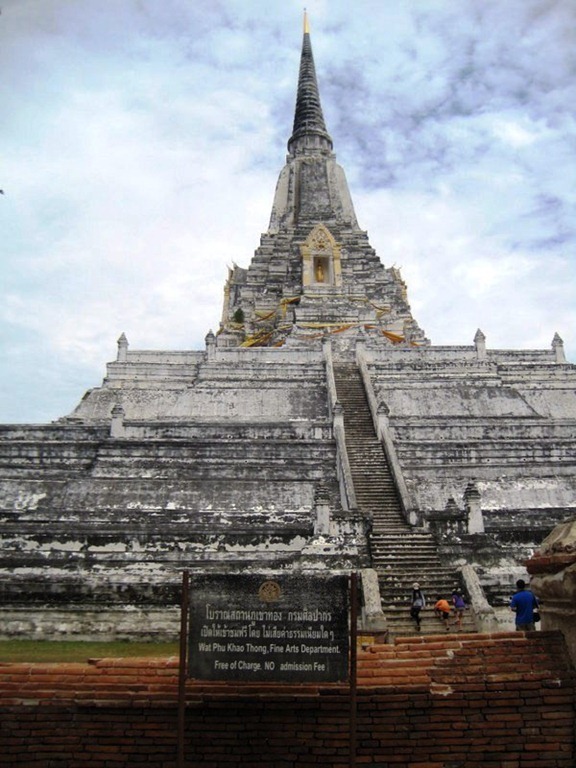 While not as famous as other historical sites in Ayutthaya, Wat Phu Khao Thong is worth a visit to climb the great chedi and enjoy the view. 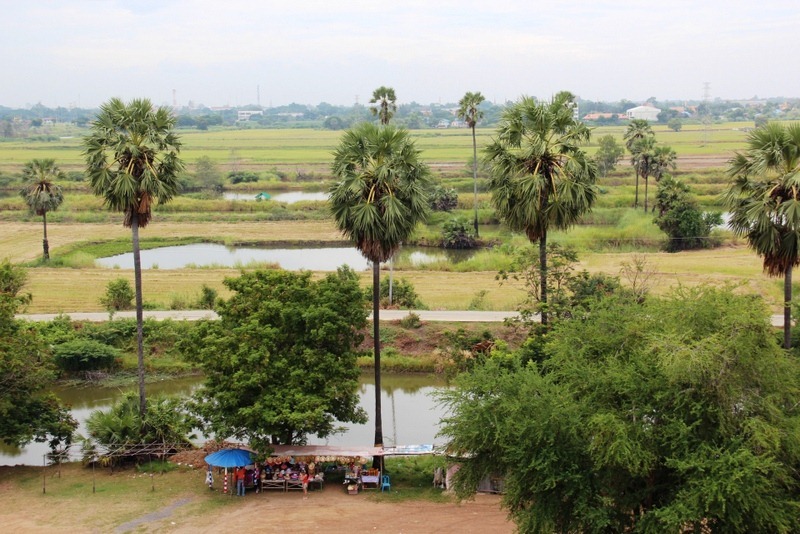 It’s one of the few places where you can bestride a remnant of ancient Ayutthaya. Thanks, Sheila! 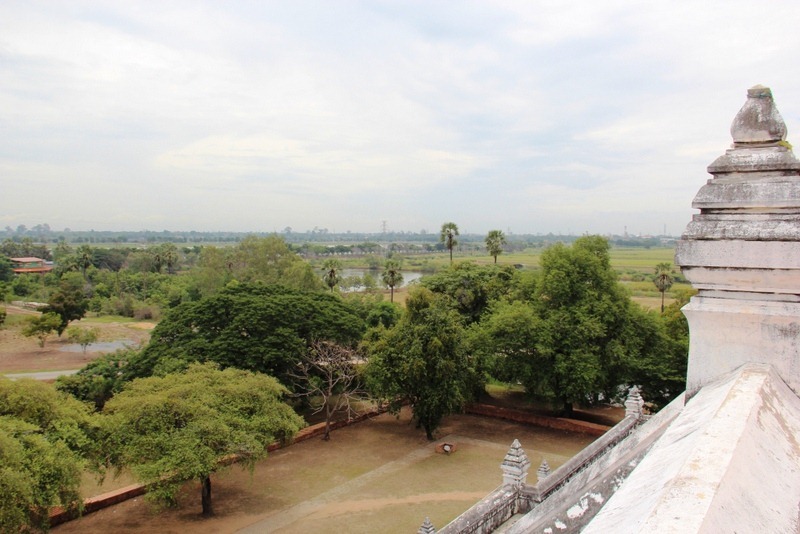 The Ayutthaya photos were so good that I had to post them right away! Many more to come.